Welcome to the original Yoga and Ayurveda program that unites both sciences into an authentic teaching approach and lifestyle-training course. This program uniquely teaches you how Yoga and Ayurveda are practiced together to create the perfect balance of practical wisdom and spirituality. If you are looking for a course that embraces the essence of all types of yoga, this is it. This program includes 250 hours of study of both yoga and ayurveda and supercedes the industry standard of two hundred hours of only postural yoga. The program meetings take place in the beautiful Ojai Valley, Ca approximately 90 miles north of Los Angeles and 30 minutes or so south of Santa Barbara. The program takes place at the exquisite Casa Tejas, a private residence custom designed for yoga practice and ayurvedic lifestyle. Casa Tejas is an oasis in the heart of Ojai just walking distance to hiking trails and the quaint town. Casa Tejas offers splendid ammenities such as steam room, jacquzzi, saltwater swimming pool and an organic vegetable garden. Students will enjoy shared accomodations and will be asked to give a donation for our cooking services if they choose. If you live in Ventura county you can commute each day if you prefer? The program is about learning through practice and strongly adheres to a experiential approach to learning. Philosophical teaching is commonly given during various exercises and rituals as well as from our staffs many years of teaching experience. You learn to practice yoga and create a lifestyle according to what is best for your dosha type (body-mind constitution) rather following some fixed formula as most western teachings follow. One of the most important themes of the program is based on this principle of individuality. In learning how to adapt a routine and a yoga practice unique to your needs, it encourages the student to be creative and dynamic as they develop into a teacher. The course also serves to prepare a person to teach others not just asana (postures) but an integral approach to yoga that includes other components such as breath-work, mantra and meditation and knowledge of Ayurvedic principles that provide for a truly holistic approach to teaching or becoming a healer. Special Points: All students also are given the option to have online access to the entire program, thus giving all participants an "open entry" opportunity to register and begin the program at any time, we encourage this as there is a substantial amount of study material becasue this includes both yoga and ayurveda. This means that you can attend live classes at any location according to your schedule and also continue your studies online. There is an additional cost to have online access (see catalog for details). Those that complete the program and its requirements will will receive certification for...250 hours as a Yoga & Ayurveda Counselor & Hatha Yoga Teacher (which adhere's to Yoga Alliance's 200 Hour RYT requirements). An important note about yoga industry standards - Students should understand that it is not required to comply with Yoga Alliance in order to teach yoga, nor is it required by yoga centers or any health institutions or spas. There are many differing views on what standards are valid. Our Dancing Shiva programs adhere to lineage based teachings and principles dating back hundreds and thousands of years that follow the path of truth and mind-body-soul evolution as taught by the gurus and teachers of these ancient traditions. This Dancing Shiva program is registered with Yoga Alliance in an effort to support their particular model or perspective for teaching yoga in the modern era. In each of the weekend meetings the curriculum is complimented with ayurvedic daily and seasonal routines, yoga practice and many other lifestyle disciplines that teach us how to integrate the principles of yoga and ayurveda into our daily lives. After completing the application all students should schedule an interview with our program coordinator. The interview serves to better understand the student background and intention and make clear the underlying purpose for taking the program. During the interview various topics are discussed such as placement, intention, finances, level of commitment and realistic frequency of participation to yoga classes and events. The interview can be done by telephone or skype. An understanding of your doshic type is an important part of taking the program and beginning the Yoga and Ayurveda journey. This session is the first step to orientation of integrating Ayurveda into your daily and eventually seasonal routine. Therefore students are required to begin the course with knowledge of their own Prakriti (constitution) and Vikriti (imbalances). The consultation and the Interview (above mentioned) can be done during the same meeting if done in person. The consultation can be done at a later date and also through Skype after starting the program. Note: Once either ($500 or $1000) deposit is made, the remaining balance will be charged at a later date by our program coordinator. We will email you before this transaction takes place. Usually, the remaining balance is charged approximately 21-30-days before the program begins. For those choosing the three or six month payment option, this will be done by our program coordinator through our billing system, however the registration fee or deposit is required first. Thank you! Your program kit to arrive in the mail within 7-10 days after registering. You are required to have all of the books listed. Specific reading assignments are given from the below texts with each program section to support the core materials outlined in the curriculum and as a supplement to the program manual. These readings are equally important to the program manual. Note: The course does require the specified material and authors listed below. I just completed the first chapter of reading from the Dancing Shiva Manual. It was very wordy and historic, but I re-read until I had a better understanding. The modules are very informative and I feel like I am in class. As someone who regularly practices asanas, I was surprised at how effective the Air sequence (DVD) was. I am enjoying this slower pace along with following your recommendations on eating warm foods in the winter. I've added sesame oil to the mix for my abhyanga (self massage) and it's great. I smell like my dinner. :) Thank you. When I made the choice to join the program I had no idea what a life changing experience it would be. I had little experience doing yoga and I had no idea what ayurveda even meant. I just knew that I wanted to be a yoga teacher, but had no idea what it truly meant to teach yoga. I found myself engaging in group discussions, sharing ayurveda with my loved ones, showing them yoga based on their dosha, meeting wonderful yogis, and creating lasting friendships. The intensive week, for me, was the icing on the cake. That week was the week in which everything came together and I grew more than ever. Everything that I had learned up to that point was now put into the form of asana. It was probably one of the most challenging and rewarding weeks of my life. I even traveled with my infant son and husband and Mas was more than happy to have them around. The amount of knowledge that was shared and the amount of one on one asana with Mas is something that you can’t put a price on. Mas lives and breathes this program and you can feel it in his energy. He is full of passion and knowledge and he pours into his teachings. I am truly blessed to have had him as a teacher and am beyond grateful for his continuing guidance and friendship. Leah Vernon (Program graduate 2013) is a happy new mom, yogini and she is being the change we need to see in the world. The day I walked into Dancing Shiva I felt I found my soul family. The warm energy and deep spiritual vibrations welcomed me and nurtured my curiosity about YogaVeda (yoga & ayurveda). Mas and staff shared eons of wisdom to help me on my path. I completed 200+ hours of training with Dancing Shiva that changed my life; the way I view every thing and every one. The physical asana practice gave me confidence as my body became leaner and my mind stronger. Our deep meditations and discussions gave me a sense of community and connection I carry with me always. Om! Calethia DeConto (Program graduate 2013) is an artsy yogini who enjoys the art of photography, writing and serving humanity with her best. Meeting Mas was such a wonderful blessing on my journey. His classes felt like home! 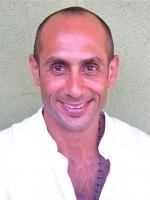 After taking the (200 hr) Yoga and Ayurveda course, I wanted more, so I continued my studies with Mas and became a Yoga and Ayurveda Therapist (500hr). Mas is a wonderful teacher and being! I would highly recommend any and all the courses he teaches. Weather you want to teach or enrich your lifestyle, his teaching is a gift for yourself and others. I am truly grateful for it all!! I appreciate the flexibility and understanding Mas shares with his students. I really enjoy the combination of live classes and the online videos (satsangas), they are easy to follow and Mas has done a great job taking the time to explain everything thoroughly. I meditated for a great teacher not just any ordinary teacher and I know Guruji (Paramahansa Yogananda) led me to you for a reason. He is always guiding and answering my prayers. I wanted to tell you also that I felt his (Gurus) presence next to me in the beginning and at the end when I was meditating in your class. "I signed up for the Yoga and Ayurveda Lifestyle Program and advanced trainings at Dancing Shiva Yoga and Ayurveda, because I simply couldn't get enough of these two ancient teachings and wanted to go deeper into my study and practice. The course deepened my personal asana practice and taught me how to live an integral yogi lifestyle that goes way beyond practicing postures. My life transformed on the deepest levels, my health improved, my spiritual practices grew, and work with my psychotherapy patients changed as well. I began to incorporate spiritual teachings from yoga and practical lifestyle recommendations from Ayurveda, and my psychotherapy practice quickly became more and more holistic. A true blend of East and West. I continue to go back to the material from the course; it is so rich, and there are always new ways of understanding these beautiful teachings. I recommend this course, and it's wonderful teachers, for anyone who wants to explore and integrate yoga and Ayurveda into their life." I have really fond memories of my time at Dancing Shiva. The 200hr training taught me a lot about yoga philosophy and Ayurveda, which gave me a really good foundation to build upon as I moved into the world to teach and live those teachings with more depth. I currently teach mostly privates and still refer to the manuals I got from my 200 hr training and two subsequent 50hr trainings. Mas’s classes themselves are reason enough to check out Dancing Shiva’s offerings. I still remember that sweet, warm room and how hard we worked. I also studied a lot under Johanna (DS faculty) in the independent training and had an excellent experience with her. She knows and lives yoga and Ayurveda 100% and I cherish having been able to work with her. A really special experience! I just wanted to take a minute of your time to thank you with my whole heart for everything you have taught me. As we approach the 1 year anniversary of our program training, I can't help but look back and smile when I think of how much I have grown. A year ago I couldn't even teach to our small group without being a stressed out mess. This morning, I taught to over 50 people. You are still the voice in my head when I fumble or can't think of what to do next. People appreciate my traditional style. I don't use music, I focus on pranayama, and stick to the basics. I can't thank you enough for teaching me the true way and for inspiring me to follow my dreams. I love this happy, healthy, and humble life. Program Graduate (2013), mother and happy person. Program graduate (2014) and lifestyle enthusiast.